Giving a customer a little something extra has long been a hallmark of quality customer service. It's a great way to add perceived (and real) value. In today's increasingly digital world, this perception of value has not changed at all. This creates a tremendous opportunity in which the business can offer free Wi-Fi to its customers. Why is it such a great opportunity? Let's take a look. For years, coffee and bagel shops have offered free napkins printed with their logos. This is done both as a courtesy to the customer and as a way to get the brand in front of as many customers as possible. Now, just as you would a printed napkin, offer free Wi-Fi. A customized login landing page has your brand information directly on it, and like the napkin, you are providing a service to a customer in need. Of course, the landing page can do a lot more than just show the brand (which we'll discuss in a moment), but it reinforces the added value for the customer. The good news is that you won't have to order extra custom printed napkins to get the word out. It can be difficult to get repeat customers to acknowledge your daily specials. Sometimes they order their favorite without even glancing at the menu. While this kind of repeat business is an excellent thing to have, sometimes you want to entice these loyal customers with new offerings before they notice them elsewhere. The Wi-Fi landing page is a great place to show off specials. The customers have to interact with the page to log in and get the free connection. As they do, the special of the day will be right in front of them, making sure that they see it. 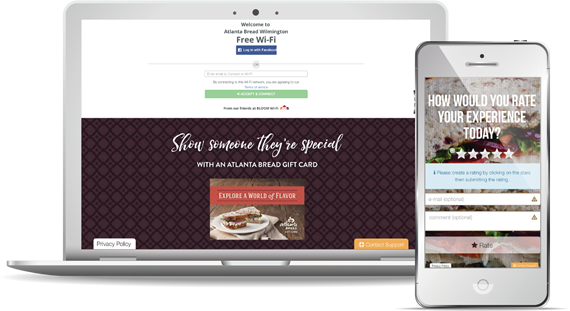 A Wi-Fi landing page is a great place to collect information about loyal customers. You can quickly gather their name and email information for use later to promote your business. Imagine a newsletter for a coffee shop that talks about the latest roast or seasonal flavor, and it goes out to all of your best customers. A customer list can also be used to drive new customers to your door. 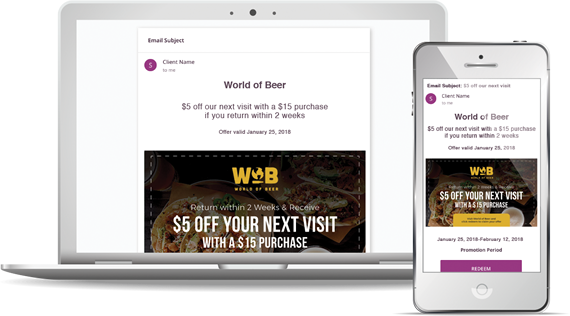 You could, for example, send out coupons to loyal customers that they could share with a friend who hasn't experienced your fantastic menu. There are many different ways a customer list can help with your business. But you have to collect the list in the first place. Having a sign-up sheet at the counter has mixed results, and often it is impossible to read the customer's rushed handwriting. A free Wi-Fi landing page is the perfect place to capture this. Even better, the customer data you collect using the landing page is from the subset of users that are embracing technology. This means that your digital marketing efforts already has the perfect target group. Free Wi-Fi landing pages are a great place to upsell the customer. Let's say that they bought their coffee and have seated at their table. As soon as they sit down to log in to your generous free Wi-Fi (which they certainly appreciate), they see an incredible pastry that would perfectly complement their hot beverage. They decide they have to get one. You can even take it one step further and make the upsell convenient for both you and your customer. Instead of fighting the crowd at the counter, let the customer order that delicious pastry right from the page. The order could be processed, money collected, and the only thing the customer needs to do is to pick up his item and enjoy it. Just as the customer bypassed the counter for the upsell above, you could also use this to streamline your business. You favorite customers can come in, sit down, and login while ordering their items. This leaves the counter free to service other customers, speeding up business and getting more people through the door. Free Wi-Fi can keep a loyal customer around for a longer period of time. By having the capacity to quickly order new items from the table as they use the service, you have the opportunity to sell more to the customer. For example, you could encourage getting one for the road. Wi-Fi landing pages offer a wealth of business opportunities, just waiting to be tapped and used. This page, to which your customers will be drawn, can serve as a gateway to increased profits and expanded possibilities. All of this is yours while offering your customers a little extra value.